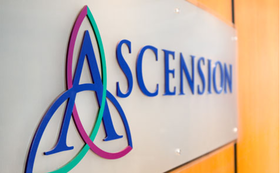 A big boost in investment income carried Ascension to a net surplus of $1.86 billion in fiscal 2017, though increased charity care contributed to operating income falling $200 million to $553 million, Ascension reported. Ascension, the nation's largest not-for-profit hospital company, saw revenue climb 3.9% to $22.6 billion, predominantly on the March 2016 acquisition of Wheaton Franciscan Healthcare–Southeast Wisconsin in Milwaukee. "Ascension had a strong and impactful fiscal year 2017 for our organization and for our patients, driven by the organization's focus on providing compassionate, personalized care for all persons where, how and when they need it," said Nick Ragone, Ascension chief marketing and communications officer. For fiscal 2017 that ended June 30, Ascension's uncompensated care rose $155 million, or 9%, to $1.86 billion compared with $1.69 billion in fiscal 2016. In the spring of 2016, Ascension decided it would waive deductibles or unpaid bills for any patient earning below 250% of the federal poverty level at any of its more than 140 hospitals and other facilities across 24 states. With Wheaton leading the way, inpatient admissions in 2017 rose 1.8%, inpatient surgeries increased 1%, outpatient surgeries rose 0.2% and emergency room visits increased 4.9%. St. Louis-based Ascension is primed to grow again through acquisition. In August, Ascension agreed to acquire another Catholic-sponsored hospital system, Presence Health in suburban Chicago. If the deal is completed, Presence, which owns 12 hospitals but is selling two, will be owned by Ascension but operate in a joint venture called Amita Health that Ascension already has with Adventist Midwest Health. A $1.4 billion investment gain in 2017 from more than $16 billion in long-term investments helped carry Ascension to a strong 2017 net margin of 8.2% compared with 2.2% in 2016.